Those people who know me, will know that I have very good organisational skills. People are often amazed at how much I get done, but I can let you in on a little secret: I have tools to help me. And in fact, I am willing to share them with you. There are many sites out there, including Apple themselves, who will tell you what good Apps are out there. But in my opinion most of those will tell you what the App does, and perhaps how many people have downloaded it, but it won’t tell you how to apply the use of those Apps to you every day life to make your life simpler, easier and of course more organised. So I am going to write a series of blog posts over the coming weeks which will give you just that: Apps categorised, but giving you an insight as to how I use them. Of course everyone is different, and you may not want to use them in the same way I do, but perhaps it will make you think about the way you use them. I might be organised, but I am rubbish at remembering dates. They just don’t stick. So I use Occasions to remember those important dates: birthdays, anniversaries (including my own!) etc. Now the secret here, is to add a date immediately when you come to hear of it. If you think you’ll do it later, you’ll probably forget. Facebook users, you can pull through all your friends’ dates automatically from Facebook. Cost: Yes it costs money! 69p at the time of writing. However, combine it with Red Stamp or Cartolina, (details to follow another day) and it will be the best 69p spent in a long time! Drawbacks: if there has been an App update, check whether you may need to re-import your Facebook dates, because I recently forgot a friend’s birthday because of this! Any.DO is the best ‘to do list’ App I have found thus far, and I have tried a few, including the Apple one that came with the iOS 5 upgrade. It is dead simple to use, and items on your list can easily be dragged between the categories. And I love their ‘someday’ category! How many of us have things that need to be done ‘someday’. I explained to a friend yesterday, unless you make a list of all things you need to do, when you suddenly find yourself with some time available, you won’t be able to start working on them right away, and to be honest, you’ll probably forget. The other lovely thing is that it predicts text, so if you start typing “pick up …” it will make some suggestions that you can immediately select, or you can keep typing a bespoke item. It also learns from previous items. So if you you had entered “pick up cat food” previously, it will come up as a suggestion. And in landscape mode it shows how many items you have per day on a calendar. 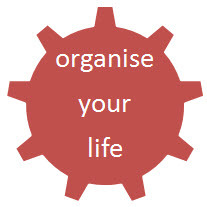 I use this daily – I used to have a very organised list in a book, which I am slowly converting onto Any.DO. But the same rule applies as before: when you’re out and about and think of something you need to do, put it on the list immediately! It only takes 10 secs, honestly. Cost: Free! Just get it! Drawbacks: Until I can learn how to back-up or export the contents from the lists, I am keeping the paper list too. I have had Apps fail, which meant that I lost all the data contained in them. They apparently do have a sync to Google Chrome, but I haven’t explored that yet. And you can set it up to auto-colour calendar items based on the words they contain, e.g. Book Club is automatically coloured pink on mine. The thing I like most is the many views it gives you: List & Search, Day, Agenda, Week, Mini Month (personal favourite), Month, Year or Today. But most of all it is just very easy to use. Cost: £1.49. I know some people just don’t like paying for Apps, but think of it this way: what is your time worth? And compare it to the price of a coffee … I paid £3.19 for a small back coffee the other day! Drawbacks: Although you can sync calendar items to Outlook, if an update on a meeting is emailed to you later, it won’t update. You need to accept the update on your computer, then re-sync your iPhone for it to take effect. Also, if you have sent an invite to someone else (via email), they aren’t updated with changes automatically – you would need to re-send it, and they would need to accept on Outlook and re-sync as suggested above. I also use Dropbox to store my guarantees for product purchases, my iPhone pictures are automatically backed up when I sync, and very important, I always have an up-to-date copy of my CV ready and waiting on Dropbox. You never know when you might need it! I can email it to anyone in an instant. Dropbox is also great if you have to share some files with someone in a remote location. Many of my folders are shared with my family members in South Africa, or colleagues abroad. Lastly, you can create a public link to any file in Dropbox too (from a computer). This will give you a URL (web address) which you can email out. This is particularly useful if you’re doing Microsoft Word email mail-merges. You cannot attach files as standard during an email mail merge, but you can add a link to your public document in the body of the email. I use this often. Cost: Free! So why wouldn’t you? And the if you get your friends to join, Dropbox give you more space in return. Drawbacks: Always remember that if you access Dropbox from a public space, your need to log out of your account – especially if it contains sensitive information. You don’t want your documents to fall into the wrong hands!